Semi-desert, foothills. Canyons, woodlands, shrublands. Spring. Ephedra viridis is the most common of the Ephedra in the Four Corners area but several other species do occur. Ephedra torreyana is easily distinguished from the far more common E. viridis by its lighter green-gray color, its interlaced versus vertical growth pattern, and by the presence of three, not two, cone structures at the nodes. The Ephedra genus is the only member of the Ephedra family with about forty species world-wide. The name "Ephedra" is from ancient times, dating back to Pliny's use of the name to describe Equisetum. But three thousand years before Pliny the Chinese realized that some species of Ephedra had medicinal properties for treating respiratory ailments; we now know that Ephedra taken orally stimulates the body in a manner similar to injected adrenaline. Ephedra is now synthetically produced under the name "ephedrine" and is one of the leading over-the-counter and prescription treatments for allergies, congestion, asthma, etc. 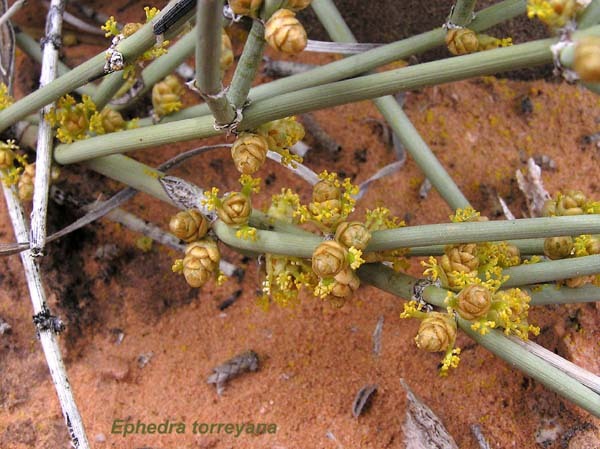 The Four Corners common species, Ephedra viridis, has little or no ephedrine in it, but Western U.S. residents have for many years brewed what some consider a soothing tea, Mormon Tea, from stems of various Ephedra species. "Torreyana" honors John Torrey (1796-1873) who was the foremost botanist of his time and the teacher and life-long friend and associate of Asa Gray.